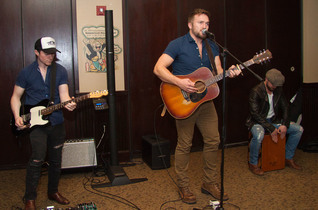 NASHVILLE – Bose Professional provided L1 Model 1S portable loudspeaker system and T8S ToneMatch mixer for a performance featuring Country artist Logan Mize during Country Radio Seminar (CRS) week in Nashville. CRS (Country Radio Seminar) week in Nashville annually draws together key players from the radio and music industries. As such, it’s a prime opportunity to showcase artists and their music and to promote their accomplishments before an elite audience. Marking the success of 100 million streams on his current album Come Back Road, country artist Logan Mize was featured by his label Big Yellow Dog Music at an intimate gathering during CRS week, with support from Bose in the form of an L1 Model 1S portable loudspeaker system and T8S ToneMatch mixer. The mid-February event, held in a private room at The Palm in Nashville, was attended by execs from Apple, Spotify and numerous radio and streaming music program directors attending CRS. Kicking off the event, Big Yellow Dog Music co-owner Carla Wallace presented the artist with a plaque commemorating over 100 million streams of Come Back Road, confessing that Mize has a unique voice she “can’t live without.” Joined by bandmates on electric guitar and cajón, Mize treated the audience to two tunes, beginning with a rendition of his hot charting current single, “Better Off Gone”. The gathering’s audio requirements were easily met by the Bose L1 Model 1S system, with its single articulated array and companion bass module providing 180 degrees of clear, even coverage and, by design, handling both PA and monitoring duties. The companion Bose T8S ToneMatch eight channel mixer provided all the I/O, mixing capability and processing needed for the performance in an intuitive, artist-friendly package. For more information, visit https://professional.bose.com/l1.